I’ve been in the Interactive-Visuals field for going on two decades now … and the field just gets richer, deeper and more known every year. It’s truly an exciting time to enter into the field, however, there are a few things you should know if you are contemplating developing a career or hobby in the visual way of working. As a mentor who has coached hundreds of people in successfully developing their visual craft … here are my tips on how to have a successful entry. One of your first steps (after browsing the internet and reading books) is to get yourself to a decent basic training. For good and for bad, there are now a plethora of beginning level visual scribing and visual facilitation trainings popping up. Good – because there may be an offering closer to home or cheaper than there used to be. But bad – because the quality of some offerings leaves much to be desired, so as a consumer you must do your due diligence in finding a good one. I’ve offered my Fundamentals of Interactive-Visuals training for over a decade now. 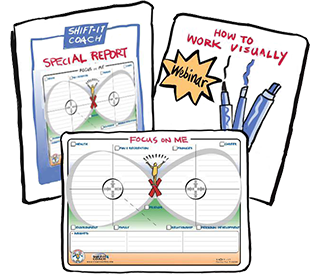 It thoroughly covers the basics and how they can be applied to the four main ways of working visually (custom chart work, visual scribing, visual facilitation and visual coaching). Lots of marker work and practice in a safe environment with other visually interested participants from across the globe. My course is offered twice a year (in-person in beautiful Victoria, British Columbia, Canada in May and online for 9 weeks in Oct.-Dec.). I also offer private and in-house trainings. In addition to my own trainings, I recommend the trainings at The Grove Consultants International in San Francisco (David Sibbet was my first mentor and a true founding father in the visual way of working) and Crowley and Associates in Maryland (Deirdre is a good friend who shares my same philosophy about the work being about PROCESS first and foremost not art). There may be other good trainings out there but at this time I’m not prepared to back them publicly due to needing to know more about their structure and philosophy. As I’ve written about extensively before, in my opinion there are four main applications in the Interactive-Visuals genre (custom chart work, visual scribing, visual facilitation and visual coaching). See 4 Ways of Working Visually for more details. 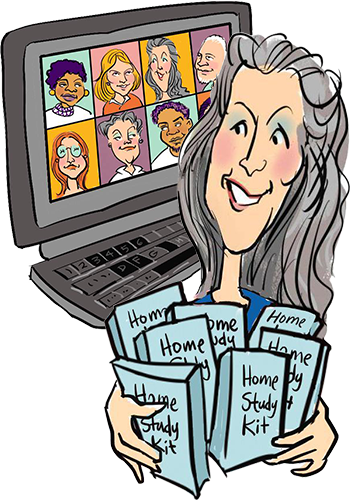 After receiving good basic training, your next task in becoming a functioning visual practitioner (whether for work or fun) is to decide upon your primary area of interest. Which genre do you want to commit to as a starting focus? My suggestion is that you pick one to start with, then you can add others as you go along. As of late, more and more formally trained illustrators, artists and designers have been getting turned onto this niche. If you come from this background, a natural place to apply your skills is in Custom Chart work (including the time-lapse recording videos that have become all the rage) and visual scribing/graphic recording. Should you wish to enter into true visual facilitation work, you’ll most likely need to hone your understanding of facilitation and process before you can effectively work on that side of the spectrum. If you aren’t an artist (and don’t want to invest heavily in becoming one) but do have facilitation, coaching or other process experience then visual facilitation and/or visual coaching are going to be your starting places. You can take your basic visual skills and start applying them to processes that you already design or lead. And/or you can learn handy ready-made visual processes like The Grove’s Strategic Visioning Process (for strategic planning work with groups) and/or my SHIFT-IT Visual Coaching Process (deep personal thinking for individuals, life and business partners). I believe Global Business Network has also template-ized their Scenario Planning. If you aren’t already a facilitator, but are interested in becoming one, then a basic facilitation and/or strategic planning course will serve you well. Then you can start adding in visuals to the way you facilitate (or act as a visual scribe in settings where someone else is doing the lead facilitation role until you are ready to start co-facilitating or taking on the lead role). This work is about PROCESS not art, so you really need to know and hone your process abilities in order to effectively perform visual facilitation. Once you have determined your focus area, you will enter an extended practice period. Please note, you will not become a skilled Visual Practitioner overnight (no matter who you are). You, like all of us who have become proficient in this work, will have to enter into a sustained development period in order to hone your craft and your internal confidence. It takes chutzpah to draw, doodle and format thinking publicly. You may have early wins right off the bat, but please be prepared that it may take months and even years to fully stand tall in this work. You may need to take on pro bono work to begin with and lower rates as you build your portfolio, contacts and network. There is no shame in this. Its realistic and a fact of life. Committed people who maturely accept this do well … folks who have immature expectations don’t. While this is a captivating, fun and even glamorous field … it is a skilled craft and a business like any other. So you must be prepared to put in your mileage to reap the rewards. Speaking of business, concurrent to honing your skills you will also be building your practice (if you intend to do this work beyond a general interest or hobby). One of the reasons I have been success in this work is because I invested extensively in business development and marketing training, particularly online methods. Moving back to Canada (after years in San Francisco) and living on a beautiful island, it was a necessity that I learn how to market and promote my visual work effectively (at that time there were few practitioners in this country, let alone the world). Nowadays, given the global interest in working visually, it is easier (cause early adopters like me have paved the way for you). However, due to increased volumes, you will need to learn how to differentiate your offering and yourself – from others in the field. And learn how to effectively attract the kinds of clients you care to work with (see my How to Effectively Select a Visual Practitioner article for the client’s perspective in all of this). Even though the visual way of working is growing in leaps and bounds, it’s still a unique niche and as such it can be lonely at times. As you continue to develop your craft and yourself, it will become increasingly important to surround yourself with like-minded and hearted people … to build community via your Visual Tribe. Not only is ongoing networking and community good for business, it is good for the SOUL. In order to be successful at this work (or any work for that matter), it’s important to strongly believe in what you are doing and to rejuvenate and keep things fresh. To keep an excited, motivated, and energetic vibe within yourself and your work. Its imperative to befriend others and find qualified mentors who can assist your ongoing evolution. As you progress, you will grow out of early visual interests, friends and mentors and into new ones. This is a natural and healthy process, as you change and morph to new levels. We all stand on the shoulders of folks who come before us. And we all have opportunities to give a leg up to others who are coming after us. That is the natural evolution of a field. And the visual field is no different. 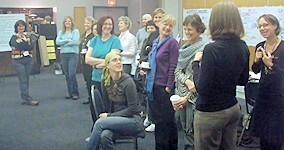 Good places for continued networking and mentorship are Magic Marker Mastermind, Visual Coaches, Forum for Visual Practitioners, VizThink, Center for Graphic Facilitation, Facebook Graphic Facilitation Group and Neuland. I’m sure more will emerge as this wonderful field continues to morph and SHIFT.